A customer walking the last 100km of the Portuguese Way of the Camino de Santiago, from Tui to Santiago de Compostela in Galicia, has shared a very interesting tip for other pilgrims travelling that route. If you are walking the last 100km of the Portuguese Way, your Camino trip starts in Tui, Galicia. 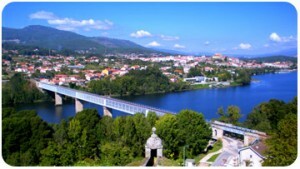 However, Tui is only separated from Portugal by the river Miño and linked to Valença do Minho across the river by a couple of bridges. Since your walking trip doesn’t start until the day after arrival, depending on your flight times you should have time to explore the town of Tui. In this case, as they had enough time on their arrival, they decided to walk across the International Bridge over the river, crossing into Portugal to the town of Valença do Minho. To put the ‘Portuguese’ into their ‘Portuguese Way’! In her opinion, this made the trip extra special. Thanks for the tip, Maeve! The International Bridge was completed in 1884 and has often been (wrongly) attributed to be the work of Gustave Eiffel, of the Eiffel Tower fame. Once in Valença do Minho, head to its famous fort and wander the streets inside its walls. From the fort you will get great views of the river, the International Bridge and Tui. This ‘tour’ will add approximately 6km to your walking holiday. Do you have a good Camino de Santiago tip you would like to share? Let us know!